It’s been a long wait… And the moment has finally arrived! After working hard for the last couple of months, especially over almost all the weekends or Saturdays to say the least, this next long weekend is going to be a much needed break traveling to my favourite destination in the world, eighth year in a row! While most trips to the mountains are either an escapade across the longwinded journeys of durations beyond 10 days, sometimes, long weekends give that amazing opportunities to just take a glance at the love of your life, give a peck and come back to return to your hustle and bustle of the city life! Considering the next week is one such long weekend, we thought it would be a great time to say hello to the mountains, spend a few days in the mountains and enjoy the breathtaking views of the snowcapped Himalayas. This time, we’re off to Naggar, a quaint little village, about 20 odd kilometers from both Kullu and Manali. Considering, it’s also just about the right time where the weather in and around Himachal Pradesh would be pleasant to cold, it’s certainly a good idea to spend some time in here. While, Manali is like a pitstop to most travelers heading to the beautiful locations of either Leh-Ladakh, Spiti Valley or many other sought after destinations in the Northern Himalayas, this village-town was a great find, especially because it’s a little off-beat and also would give us some time to explore Manikaran, which maybe a little touristy, but right around this time of the year, all the more beautiful. So, yeah, come this next week, the plan is to kind of unplug, unwind and settle down with some reading, conversations with friends and pondering over into oblivion while gazing at the snowcapped mountains, spreading grandeur across our lives. The Castle in Naggar is of a medieval structure and considered as a prominent tourist spot found nearby Manali. It was constructed in 1460 A.D. by Raja Sidh Singh of Kullu. The castle is of an architecture that is a blend of western and Himalayan style. The castle is strategically located near Beas River and provides 360o view of the surroundings. The castle houses the Reorich Gallery that exhibits the painting of the well known Russian painter, Nicholas Reorich. Constructed with a blend of stone and wood, the mansion was once the home of the Raja, but was rehabilitated to a rest house in the year 1978. This is a place which is beautifully maintained.A small cottage where the. Ground floor is dedicated for the paintings and the first. Floor displays rooms with the furniture used by the Roerich’s. Takes you back to the old world charm. This place is a must For art and history lovers. A good ride for off road seekers and as well trekkers because the way from Naggar to Bijali Mahadev temple leads through cedar, pine forest and goes through top of the ridge of Pirpanjal range. Once you reach in the temple you can have a 360 degree panoramic view of Kullu and Parvati valley. Hope this turns out to be a really interesting trip! 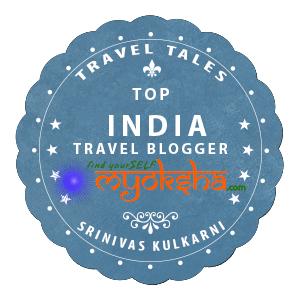 This entry was posted in North, Tales from Himalaya and tagged Bijli Mahadev, HImachal Pradesh, Himalayas, India, Manali, Naggar, Travel, Travel Blogger India on March 20, 2016 by srinistuff.